Borderlinx | Buy Kitchenaid and ship worldwide with Borderlinx. Cheap rates guaranteed. Founded in 1919, KitchenAid USA is an American company that makes high quality appliances just for the kitchen. Since the 1930's KitchenAid USA is best known for their signature 'K' stand mixer, a timeless model that combines timeless design, quality craftsmanship, and pioneering technology. KitchenAid USA makes top of the line kitchen appliances trusted by professionals and consumers around the world for commercial, professional and individual use. KitchenAid USA has won numerous awards for its design and quality creations. KitchenAid USA has all the appliances to fully equip a professional or home kitchen. Make delicious smoothies, sauces, cocktails or soups with the powerful performance of KitchenAid USA Blenders. From microwaves to food processors to kettles and coffee makers, KitchenAid USA has all the equipment you need, and each appliance is top of the line quality for power and durability. Trust KitchenAid USA Major Appliances for the larger appliances in your kitchen: dishwashers, refrigerators, trash compactors, grills and more. KitchenAid USA Stand Mixers start at $299 and come in a variety of different colors. KitchenAid USA products are all top rated and made to last. 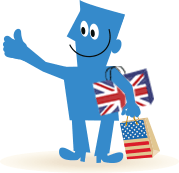 Thanks to Borderlinx, you can now shop at KitchenAid in the USA and ship to your home country, paying cheap international shipping, tax & duties upfront. Calculate your shipping, tax & duties upfront thanks to our shipping cost calculator. A number of services are available through Borderlinx to make international ordering from KitchenAid USA hassle-free, including concierge, free repacking and consolidation services.